If you are looking to attach different add-ons for the excavator, the multi-coupling system from RSB SIDE WORKS makes it easy with a simple plugin option. The multi-coupling will allow you to attach several different add-ons to the excavator Eurocomach ES 60 TR. Where you will be able to multi task without losing the functional power of the excavator. On the Eurocomach ES 60 TR an additional hydraulic circuit with 12 V power supply is included on the excavator. For you have the extra power for additional attachments and digging. For easy attachment there are two eyelets located on the front of the excavator offering easy attachments for the multi-coupling. 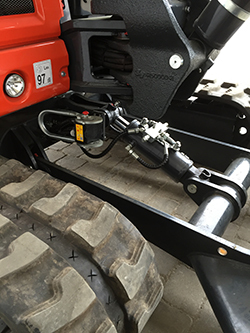 In this way, an attachment from the RSB SIDE WORKS range can be added to the excavator in just a few minutes and connected and locked to the power supply of the excavator with a plug that is protected against polarity reversal and clean.